The Cumberland & Dumfriesshire Farmers Mart P.L.C. had forward 60 prime cattle, 3 young bulls, 15 over thirty month cattle, 1,276 prime lambs, 1,542 prime hoggs and 3,358 cast ewes & rams at their weekly sale at Longtown on Thursday 17th June, 2010. Clean cattle were sharper to a top of 178.5p and 169.5p for Limousin heifers from Hallburn; Charolais 160.5p (£1,099) Gretna House. Limousin bullocks to 168.5p The Gill, 167.5p and 164.5p (x2) Dashwellgreen, 166.5p and 165.5p The Gill, 164.5p Hallburn. Charolais bulls to 153.5p Gretna House; Black & Whites 125.5p Harelawhole. A smaller show of OTM cattle sold to 127.5p for Limousin from Brisco Hill; Hereford 97.5p Greenburn; British Blue 97.5p Burnside; Shorthorn 95.5p and 93.5p Minsca. Limousin bullocks to 114.5p High Floweryhirst. The 1,276 prime lambs were the largest show of the season so far. Trade was slightly easier on the week with the sale levelling at 171.2p per kilo, however, lambs are still £4 to £5 dearer on this week last year. Top price per kilo of 212p for Texels from Messrs McGimpsey, The Thorns and to £94.50 per head for Texels from Angus Sutherland, Carran Farm, others £90 Carran, £83.80 Smalmstown; Suffolk £87.80 The Land, £86.20 Sykehead, £82.80 Swainsteads; Oxford £73.20, £68.20 Guards; Charollais £68.20 Hallburn, £59.80 Mossthorn; Lleyn £63.80 The Height; Greyface £63.20 Broomhills; Bleu d’Maine £60.80 Mossband House. Another tremendous show of 1,542 prime hoggs saw many consignors continuing to have an end of season clearout, however well fleshed hoggs were still in demand leading to a sale average of 134.5p per kilo. Top price of 166p per kilo for Texels from Gate & West Farm and to £85.50 per head for Texels from Mr Putt, Branteth, others £83.80 Borlick, £79.50 Linton House; Greyface £78.50 High Dubwath, £77.50 Minsca, £76.50 Stackbraes; North Country Cheviot £73.50 Linton House, £72.50 Newington; Charollais £69.80 Lydden Court; Suffolk £65.50 The Mark and Crawfordjohn Mill, £62 Coytre; Blackface £63.50 Branteth, £62.50 Smalmstown, £60.50 Sockbridge Hall; Hill Cheviot £60.50 Newington; Jacob £60.50 Branteth; Lleyn £58.80 The Mark; Swaledale £58.50 Whitton, £56.50 Thornhope; Shetland £57.80 Sockbridge Hall; Beltex £54.50 Stackbraes. A similar show of 3,358 cast ewes and rams with all classes sharper on the week. Good meated selling ewes were easy to sell, however fat types were still hard to cash. 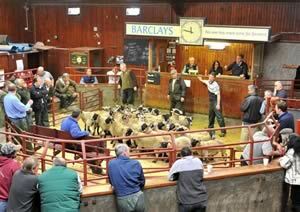 Top price on the day was £158.50 for Leicester tups from Messrs Edgar, Whitton, others £146.50 Coytre; North Country Cheviot £143.50 Whitton; Charollais £137.50, £136.50 Coytre; Texel £136.50 Mid Farm, £134.50 Coytre; Suffolk £133.50, £124.50 Coytre; Blue d’Maine £129.50 Graystale; Hill Cheviot £70.50 Graystale; Woodland £69.50 Achnamoine, £66.50 Kilncroft; Blackface £67.50 Sockbridge Hall, £62.50 Whitton; Jacob £60 The Nook; Swaledale £59.50 Wolfcleugh Cottage and Sockbridge Hall. Heavy ewes to £140.50 for Texels from Coytre, £118.50 Alton and Carran; Suffolk £136.50 Seavers, £126.50 Alton, £124.50 Glenafon; Charollais £118.50 Stackbraes, £102.50 Alton and Seavers; Bleu d’Maine £108.50 Seavers; Half Bred £100.50 Gate & West, £91.50 Stackbraes; Cheviot Mule £88.50 Whitton, £83.50 Ty Croes; Leicester £86.50 Carrholme and Aikton Farm; Greyface £82.50 Upper Cullernie and Jacksonrigg, £81.50 Greenend; Oxford £80.50 Snowden Close; Dorset £79.50 Porpeath; Zwartbles £76.50 Stackbraes, £74.50 Thorns; Beltex £62.50 Tercrosset. Hill ewes to £82 for Shetlands from Coytre; Cheviot £72.50 Adyar, £67.50 Branteth and Whinfield; Swaledale £71.50 Whitton, £70.50 Spital Shields, £68.50 Wolfcleugh Cottage; Blackface £70.50 The Row, £69.50 Branteth, £66.50 Butterdales; Jacob £70.50 Branteth, £51.50 Whinfield; Lleyn £69.50 The Height; Clun £68.50 Sykehead; Herdwick £46.50 Kilncroft. Goats to £59.50 Seavers, £58.50 Low Rough Hill.